Fast acting gel stops bleeding fast – stops pain and disinfects too. New easy-to-use syringe applicator. Super Clot halts bleeding that is associated with minor cuts, surgical wounds, tail docking, ear cropping, nail trimming and dew claw removal. It comes in an easy to use syringe that provides controlled and accurate application. 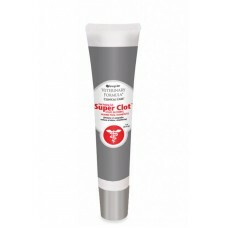 Super Clot is used in place of styptic powders and pencils that don’t have its disinfecting and numbing properties nor its ease of use. For external use only. Apply liberally to wound. Apply direct pressure to wound to accelerate the clotting process. Consult your veterinarian if bleeding persists. Keep this and all other medicinal products out of reach of young children. Ferric sulfate, aluminum sulfate, Lidocaine HcL, benzethonium chloride USP.